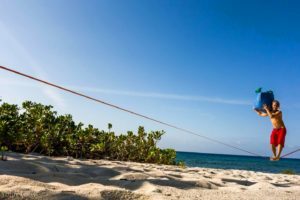 #trashbagchallenge – Caribbean Islands – Slackline U.S.
Louie Wray joined the #trashbagchallenge in the Caribbean Islands, gathering trash on the beach. Shared on SlackChat. Without having a hashtag for it, I’ve been doing the trash bag challenge for years, often towing back mounds of trash from small islands in my kayak at home. Seeing Andy Lewis constantly picking up trash inspired me to put my efforts online and inspire you wonderful people to do the same. This entry was posted in Community, Conservation, News, trashbagchallenge and tagged caribbean, cleanup, conservation, local, slackline, stewardship, trash, trashbagchallenge. Bookmark the permalink.